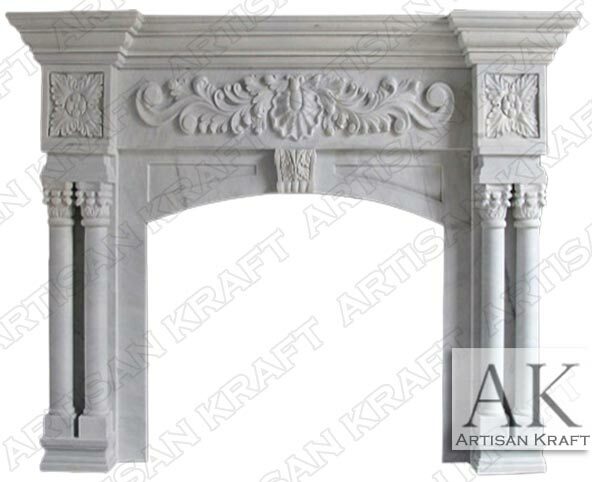 St. Ives white marble fireplace mantel has a tropical island feel to it. The whimsical Roman Corinthian column capital and the tropical floral carvings on the freeze and pediment give it that breezy regal feel. It is for sale for a great price and is a large work of art in itself. Would go great in any home on the coast or inland. Fireplace pictured in White Marble. Beautiful double column model for a royal marble fireplace design. Available for delivery in 1-3 weeks. Get this Mediterranean designed piece installed in your house today.